Supernatural Coloring Book — Color Your Own Castiel! A big bunch of quality products (like fandom t-shirts!) with Tiia’s designs slapped on them. 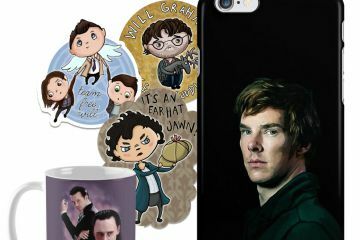 You can order all sorts of fandom shirts and other geeky products featuring her original artwork. The illustrations and graphics are all inspired by Sherlock, Supernatural, The Walking Dead, Hannibal, Breaking Bad and other favourite shows. You can order almost any of Tiia’s designs on notebooks, phone cases, stickers, postcards, pillows, travel mugs, even duvet covers! Click on a shop logo to browse & order if you like what you see. How does this work? Scroll down to read more about our merchandise designs! FAQ: You’ve designed fandom t-shirts and now sell them! How? It’s pretty simple. Businesses like Redbubble and Teepublic help artists sell their designs without any financial risk. You can upload your artwork, pick the products you think work best with your design, and then choose the background colors and the best layout option. And tadah: you’re ready to sell your designs. Of course, since these companies take care of all the rest of the business (products, printing, postage, webshop etc. ), they will get a lion’s share of the customer’s payment. But the artist still gets something! Only a few people make a living out of this, but the rest of us… Well, we just receive a few bonus pennies every now and then to finance our filming location travels and our travel blogs and what-have-yous. However, it’s all mostly for fun. It’s fun to use your fan art for something sort of real, but it’s even better to imagine that somewhere out there someone is walking around with a picture of Mads Mikkelsen on their chest that you painted. Can’t find anything for you? Why not make a suggestion? 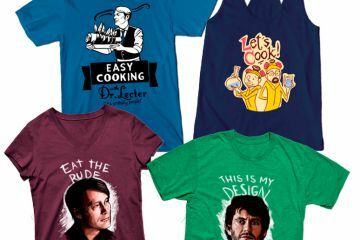 You never know, you could get a personalized doodle from your favorite show on a t-shirt! Fangirl Quest — A travel blog about film tourism: discovering new and exciting destinations through movies and TV shows. That's the short description. Visit our ABOUT page for the full story! What is "sceneframing" and why did it go viral? Check out our guides to filming locations all over the world! The New Game Of Thrones Final Season Trailer Is Here and OMG!!! Official Game of Thrones Ambassadors since 2017!